This is the second of my interviews from my visit to Gusbourne Estate back in July 2017 and someone else building a successful career based on the knowledge & experience gained from studying wine at Plumpton College Wine Division. Gusbourne is a producer of high quality sparkling English wine based in Kent. 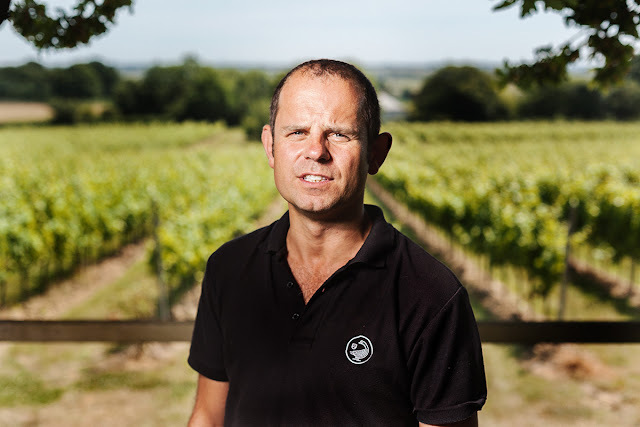 Jon joined Gusbourne as Vineyard Manager in 2004 just as the first vines were being planted, the perfect opportunity to join a wine producer in the embryonic phases and to see it grow. The role is varied with the expected highs and lows of working on the land and growing grapes in England. Successful vintages and surviving hard hitting frost are very rewarding. As the size of the team increases and people with differing skills are recruited reflecting the way the business is developing, the scope of Jon's role increases as does the job satisfaction. When asked about the best things his position of Vineyard manager Jon said "Having hands on input in the evolving business from the vineyard through to the customer. Another highlight is working in such a beautiful area, witnessing the changing of the seasons. Also, Gusbourne would not be what it is if not for the amazing team we have here". As Gusbourne expands the acreage planted in 2013, 2014 & 2015 develop into mature vines producing increasing yields which is exciting to see. Recently Gusbourne opened The Nest, the onsite tasting room with stunning views out to the English Channel & nearby Rye. The Nest is open all year and visitors need to not make a reservation to drop by to taste the wines which are also available to purchase by the glass, bottle or case. Jon's favourite is Blanc de Blancs which he says is quite linear in its youth but develops an unctuous complexity as it ages. Jon is originally from Lincolnshire, raised in Yorkshire by way of Sussex. Originally from a farming background he found himself working for Majestic Wines for a couple of years before deciding to study HND Wine Studios at Plumpton College. Studying at Plumpton seems to be the perfect route allowing Jon to return to working on the land via viticulture. During his time at Plumpton Jon gained much hands on experience and how to deal with the vagaries of the British climate, especially in relation to viticulture. Plumpton now helps Jon maintain contact with the industry as well as providing him and his team with continued professional development through the running of the Wine Skills programme. Jon is very much a family man – two boys, two dogs, one wife. If not walking the dogs and kids at the weekend near where he lives he'll be walking them at the Gusbourne vineyards. He's fan of Gusbourne Blanc de blancs 2010 in the absence of tea! He'd love to go to Oregon and see how they cope with similar climate challenges. Thank you for your time Jon and for being part of Heart of UK Wine. Call for bookings or to discuss your next project. Images unless stated otherwise remain copyright Ian Pack and are available for commercial use.